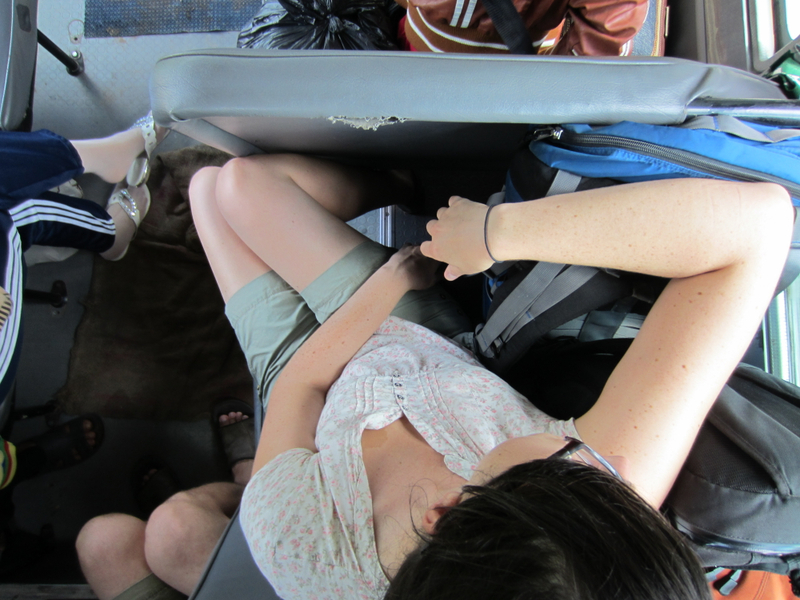 The bus dropped us at the ferry which was a steal at 1,000d/$0.05 a person. When we disembarked we weren’t exactly sure where we were, so we started walking in the direction of Vinh Long town. Ten minutes later, as the sun baked us to the road, we considered that we might be further from the town than we originally thought. We soon came upon a sign that read: “Vinh Long 2km +200m”. Hmmm… We decided to stop at a cafe, cool down, wipe our brows, and rehydrate. After checking directions with the locals we were back on the road. They didn’t speak any English, but one of them was deaf and it was surprisingly easy to communicate with him through hand signals! Four kilometres later, we arrived at Van Tram Guesthouse. 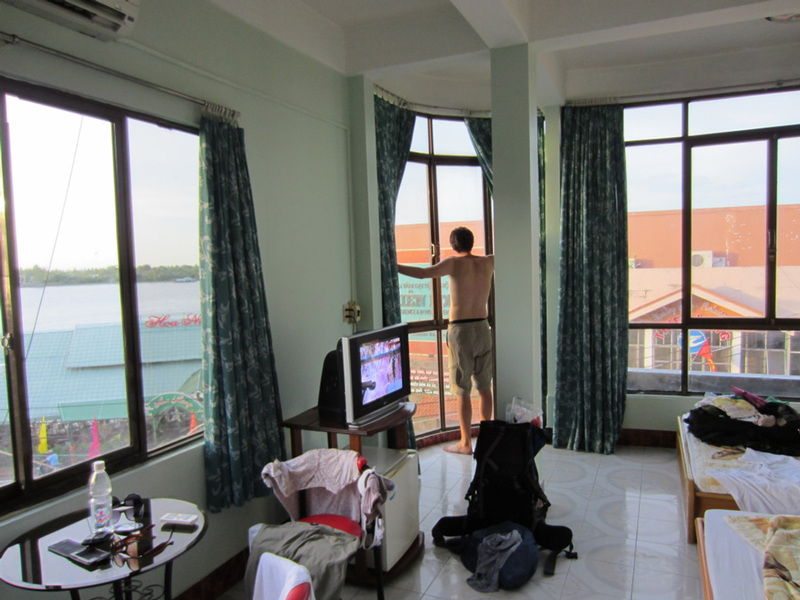 For 300,000d/$14.80, we secured ourselves a large room at the front of the building with a great view of the river. We were immediately taken aback by the amount of fruit vendors around. 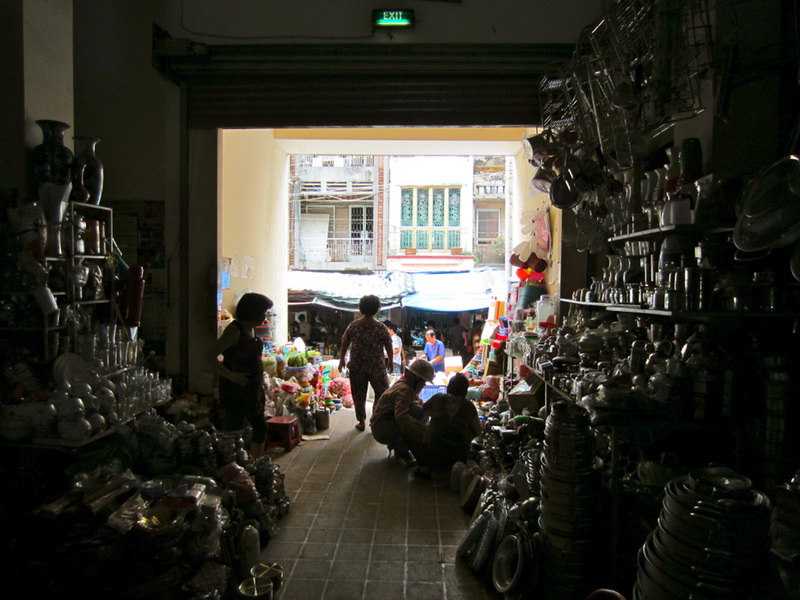 Every street seemed to be a market street, around every corner there seemed to be somewhere to eat. Most of the islands in the area are given over to tropical fruit production, most of which is shipped out to Ho Chi Minh City, so the fruit here is at its freshest. There are an overwhelming number of budget eateries, and we found a lady on a street corner who cooked us up some killer grilled pork on rice with salad and soup. This lady made us a delicious breakfast complete with spring rolls. Vinh Long is a nice place to sit in a cafe along the waterfront, lay back, and people/boat watch. There are also opportunities to take boat tours (just head to the river and someone will approach you) but we declined, opting to stay on land where the ice coffees are. Vinh Longians are friendly and the Mekong Delta, in general, has a totally different feel to the rest of southern/central Vietnam. After a few lazy days we hopped on a bus to Can Tho. Since there is no airport or train in Vinh Long, your only options are to take a bus or an expensive private car. From Ho Chi Minh City, Mien Tay bus station services the Mekong Delta. Buses leave every hour. Your best bet is to get a large tour bus. Futa Bus is a good option. They leave from the station at 8:30AM or 4:30PM (times may vary – check their site) and cost 105,000 VND. It’s also possible to catch the bus in district 10 at 328A Lê Hồng Phong. The bus will drop you off at the main bus station, which is a 10 minute drive from the main part of town, but Futa offers a free ride to your hotel on a shuttle. You might have to go into the station and show the Futa office your bus ticket once you arrive. To get back to Ho Chi Minh City, you can head back to the bus station, or check out your options at the smaller station that’s within walking distance. You might get stuck in a minibus packed with people, but the ride will probably be cheaper. If you like that sort of thing, you can probably find a minibus from Mien Tay as well. Just ask at the information desk or try and decipher the giant board. Another good company is Mai Linh (they also own all those green taxis). At 87,000 VND for a ticket, you will save some money going with them, but they don’t include the free ride to the downtown, so you’ll probably spend another 50,000 VND for a taxi. Mai Linh’s schedule is much more frequent. Buses leave Saigon every hour and leave Vinh Long coming back to Saigon every 20 minutes. The trip will take about 2 hours and 30 minutes. Local bus in the Mekong Delta. If you are coming from or going to anywhere else, you’ll probably have to take a local bus. They are fine for short trips, but don’t offer the comfort that a tourist bus does. The good thing though, they’re super cheap. 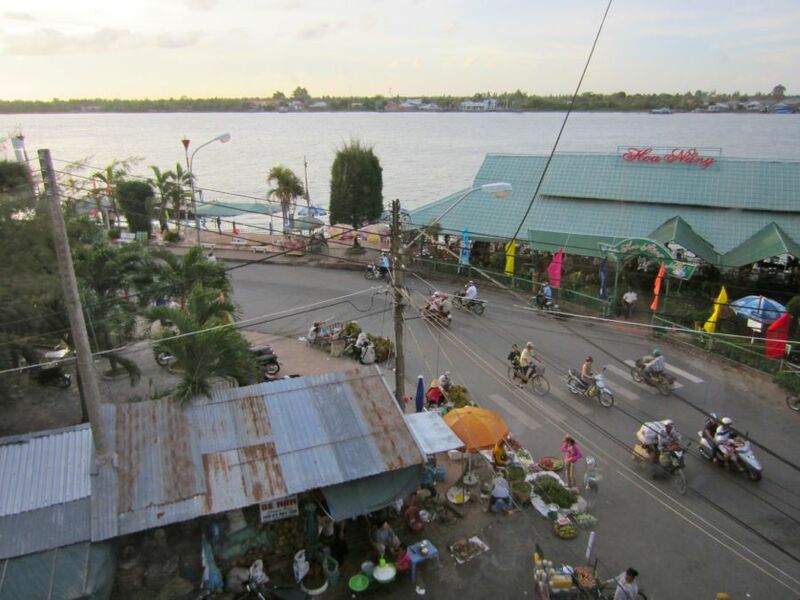 You should be able to find buses that go to and from other cities in the Mekong Delta, but some might drop you off along a highway where you’ll have to get a motorcycle taxi to the downtown. Regular taxis are often hard to find unless you are at a legit bus station. For the large cities in the Mekong Delta (Can Tho, My Tho, etc.) you should be able to find an option every half hour or so. 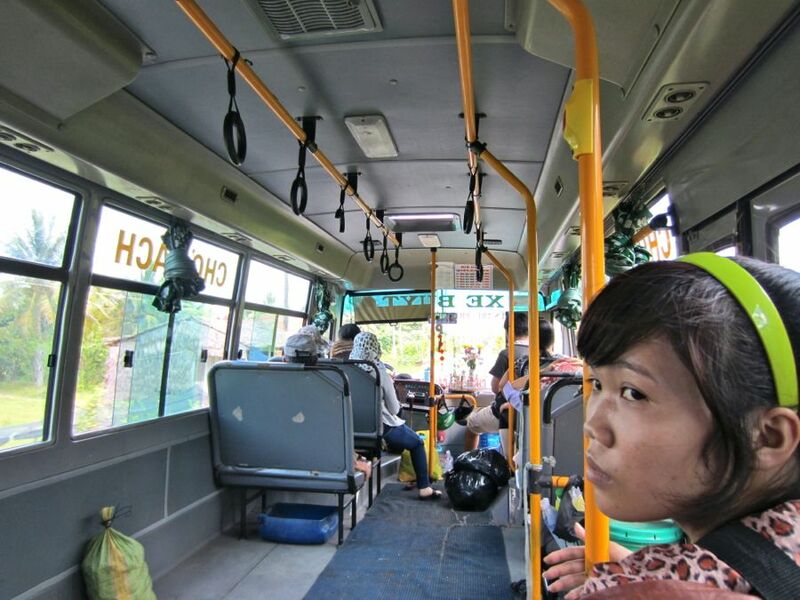 If you bite the bullet and take a taxi to the larger station, you might be able to get a big bus, but most of the big buses don’t stop in Vinh Long, they bypass it via the QL1A. If you are feeling very lucky, you could try and wave one down from the side of the highway, but you’re probably better off at the bus station. I’ve only ever stayed in one hotel while in Vinh Long — the Van Tram Guesthouse, which is more like a hotel. Why do I like Van Tram? Because it’s in the rocking-ist corner of Vinh Long. The rooms at the front have views of the river. Their windows are huge and wrap around the corner of the room. It can be a bit loud at night, but it will quiet down around 10PM. For a huge room that would sleep 4, it’s about 350,000 VND. They only have 6 rooms, but I doubt you need to book ahead. If you insist, you’ll have to call their number (070823820) to book because they aren’t on the booking sites. If pho rules Saigon, hu tieu is the king of the Mekong Delta. It’s a noodle soup that was created in Cambodia (which once included the Mekong Delta area) by Chinese immigrants. It’s hearty and was used as a breakfast to energize the farmers. 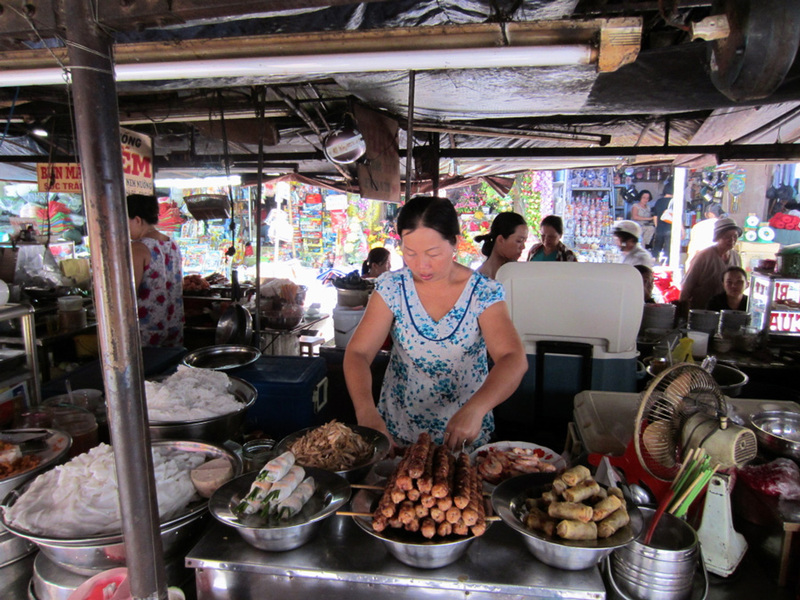 Hu tieu Nam Vang (Nam Vang is Phnom Penh, the capital of Cambodia) is usually packed with pork meat. Hu tieu My Tho, another city in the Mekong Delta, usually contains more seafood than pork. Grab some hu tieu in Vinh Long at Hieu Tieu Hong Mai (98 1 Tháng 5) where you can get a generous bowl of hu tieu hoanh thanh. Hoanh thanhs are wantons – delicious pillows of pork. You won’t regret a cheap bowl of this Mekong Delta specialty. Unfortunately, you’ll have to go to Ho Chi Minh City to get to Vung Tau. The bus to Saigon takes from 2 to 2.5 hours. Futa Buslines has buses leaving the newer bus station (not the one right downtown) at 5AM and 1PM from Mon-Thurs, then at 5AM and 2:30PM on Friday, Saturday, and Sunday. Check the times by putting in your information (or some fake information) here. The cost is 105,000 and the bus will drop you off at Mien Tay station where you can immediately take a bus to Vung Tau. If you want to stick with Futa they have buses leaving almost every half-hour between 5:30AM and 7:30PM for 100,000 VND. Mai Linh also makes the trip to Ho Chi Minh. Their buses leave very often (like every 20 minutes) and only cost 87,000 VND. They arrive at Mien Tay station, but you’ll have to go all the way to Mien Dong to catch their Vung Tau bus, so it’s better to switch over to Futa Bus at this point (or go with a cheaper but quite chaotic minibus). The bus to Vung Tau will take 2-2.5 hours. That’ll be about 5 hours in total — a heavy transportation day, but you could be on the beach by noon, no problem. Previous Ben Tre, Vietnam: Tour-less in the Mekong Delta. Next Can Tho, Vietnam and Beyond. It’s only a joke, anonymous. Love this post, thank you for your blog efforts! We are headed to the Mekong tomorrow.